There are high-performance cars, and then there are sport sedans, coupes and convertibles that will blow your doors off like the 2014 BMW M5 and M6 with Competition Package. How do you take a high-performance sedan and make it better? BMW has taken their hot-rod 2014 M5 and M6 and given it subtle styling updates, new color choices, and enhancements to interior and lighting. But the best thing the Bavarian automaker did to make the newest M5 and M6 better was what they put under the hood. BMW M GmbH will offer the M5, M6 Coupe, M6 Convertible and M6 Gran Coupe models with a new 575 horsepower Competition Package as an option for the most powerful cars in the BMW lineup. BMW is saying this is a preliminary horsepower rating and we’re wondering if it could even be more? The standard BMW M5 and M6 models are each powered by an already potent 4.4-liter V8 engine with M TwinPower Turbo technology and they come with a peak output of 560 horsepower. BMW has taken their 41 years of racing experience and fine-tuned the sports sedans to perfection. The V8 will come mated to a standard seven-speed M Dual-Clutch Transmission (M-DCT) and U.S. buyers get a choice of a six-speed manual. They also feature an Active M Differential at the rear axle, and aluminum-intensive suspension. If the 2014 BMW M5 and M6 weren’t already exciting enough, BMW upped the fun level even more with the new Competition Package for the 2014 models. They tell us the new performance package boosts output by 15 hp / 11 kW to 575 hp / 423 kW. But it could be more by the time the hot-rod sedans are launched. While an extra 15 horsepower doesn’t sound like all that much, what does it do to the performance times of the new M5 and M6? BMW tells us the new Competition Package on all models except the M6 Convertible, will help shave off 0.1 seconds from 0-62 mph (100 km/h), and 0.2 seconds from 0-124 mph (200 km/h) sprint time. For those that are track enthusiasts, that’s a significant bump in performance and offers an exhilarating driving experience. While the extra hp is nice, BMW M GmbH knows there is more to performance than just power ratings. Developers at BMW also extensively tuned the chassis to better handle the corners. The new chassis has been stiffened with new coil springs and damper calibrations and anti-sway bars. And BMW also lowered the body by 10 millimeters lowering the center of gravity which helps reduce body roll. They also calibrated the front bushings more precisely for the Competition Package. 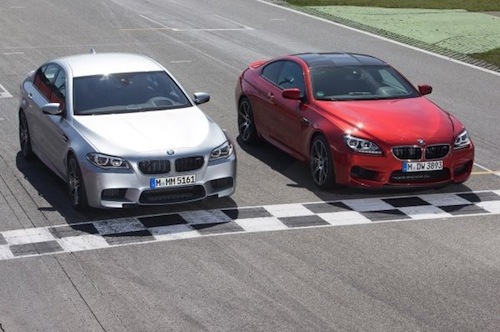 All these changes result in better cornering dynamics and tractability for the M5 and M6 sedans. While most drivers won’t notice the differences on the street, M buyers who will take their cars to the track will best experience the upgrades. In order to handle the extra hp and chassis changes, optional M Carbon Ceramic Brake system are also available on the M5 and M6. And the standard Active M Differential and M-specific Servotronic rack-and-pinion steering were tweaked for further-improved traction and agility when the Competition Package is specified. Additionally, the M chassis control system has been adapted to the Competition Package suspension profile. With the Competition Package, the M Dynamic Mode (MDM) of DSC (Dynamic Stability Control) is re-mapped for even sportier handling characteristics and higher thresholds of intervention. The Competition Package additionally includes unique 20-inch M light-alloy wheels along with a sport exhaust system featuring M quad tailpipes finished in Black Chrome that give the new M5 and M6 an unmistakable exhaust note. BMW didn’t announce a cost of the new Competition Package for the new 2014 M5 and M6 sports sedan, but look for new exterior colors including Pyrite Brown Metallic, Frozen Blue Metallic, and further BMW Individual Frozen paintwork finishes, as well as exclusive leather interior shades (Cashmere Beige and Nutmeg). Look for the 2014 BMW M5 and M6 with increased power and improved driving dynamics options later this year.